Will the Better Storyteller Win This Election? In most elections the partisans already know who they’re voting for—their votes are based on policies not necessarily politicians. But in an election as close as this one to persuade the small slice of “undecideds,” both Obama and Romney (and their army of supporters) have used every means to shape their story including advertising, stump speeches, visual presentation and robo calls. And just as much effort has been put into destroying the narrative of the other guy. Although a thousand tangents have been taken and small bore arguments made by the candidates, Obama’s storyline could be summed up as, I inherited a mess that I’ve done a lot to fix and if you elect me again I’ll continue fighting for the Middle Class. 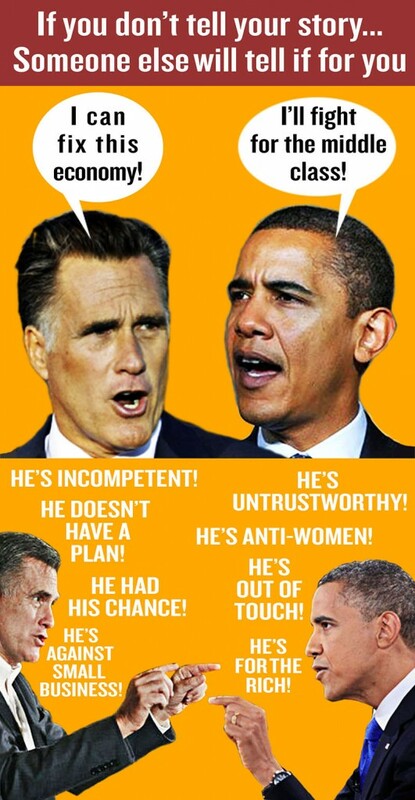 And Romney’s might be summarized as: I’m a businessman who knows how to get this economy going. In other words, in the grips of a story, we experience the narrative in the same way we would if we were actual participants in that story. An effectively told story can so weaken our rational powers of cognition and reason that the story can seem to become proof of its own content. And in this election both Romney and Obama are vying to be the one who tells the story that “transports” more voters than the other. Storytelling, of course, is an art not just practiced by politicians. Many of the superachievers we interviewed for our upcoming book recognized the power of narrative. Whether it was to develop a brand or sell a product or even market a rock band, the men and women we talked to told us about how they had put great effort and thought into shaping narratives to communicate with their target audiences. For more on “The Art of Doing,” like us here, follow us there.